’63 PONTIAC SD-421: SWISS CHEESE LITE! Production of lightweight ’63 Super-Duty Pontiacs was extremely limited, but high-profile racer Mickey Thompson got the first two. One of those featured here is in the Factory Lightweight Collection. Roger Huntington writing in Hi-Performance CARS is often credited with first using “Swiss Cheese” to describe lightened Super-Duty Pontiacs. 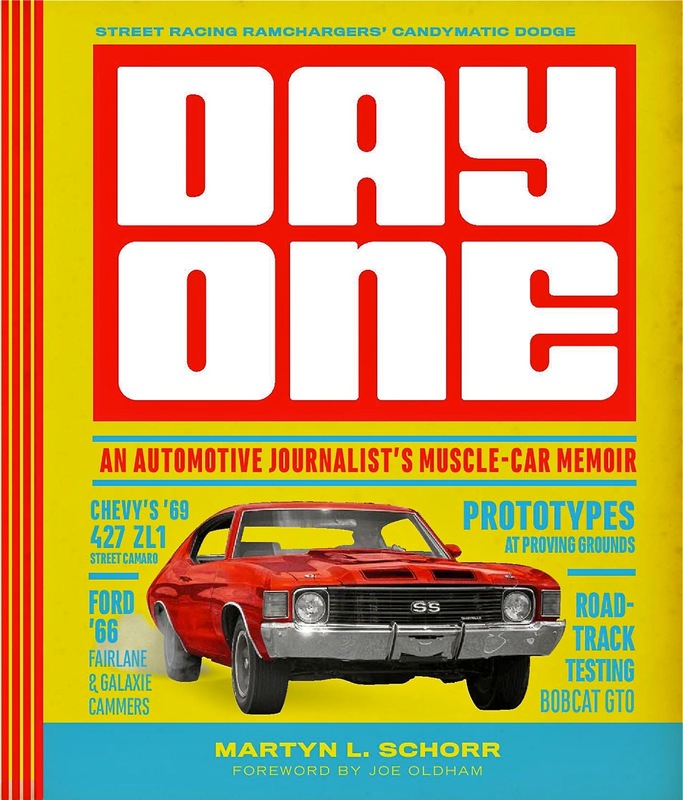 It came to him after he counted 120 holes drilled in the perimeter frame of Royal Pontiac’s Catalina, driven by Jim Wangers. A total of 18 aluminum body parts were used to reduce the weight of a Super-Duty 421 Pontiac. A lightweight Catalina weighed approximately 3,300 pounds. Plexiglas side windows and aluminum deck lids helped keep the weight down. Some early cars ran with stock aluminum hoods fitted with Ford Super-Duty truck scoops! For 1963, the SD-421 drag racing engine was improved considerably. 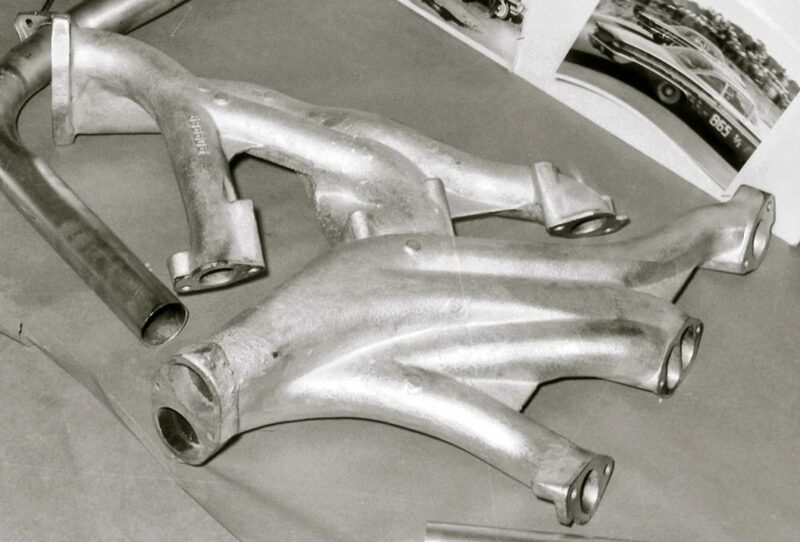 Head castings were modified with taller intake ports, oval-shaped exhaust ports and fitted with larger 2.02-inch intake and 1.76-inch exhaust valves. New forged aluminum pistons raised the compression ratio from 11 to 12.5-to-l. 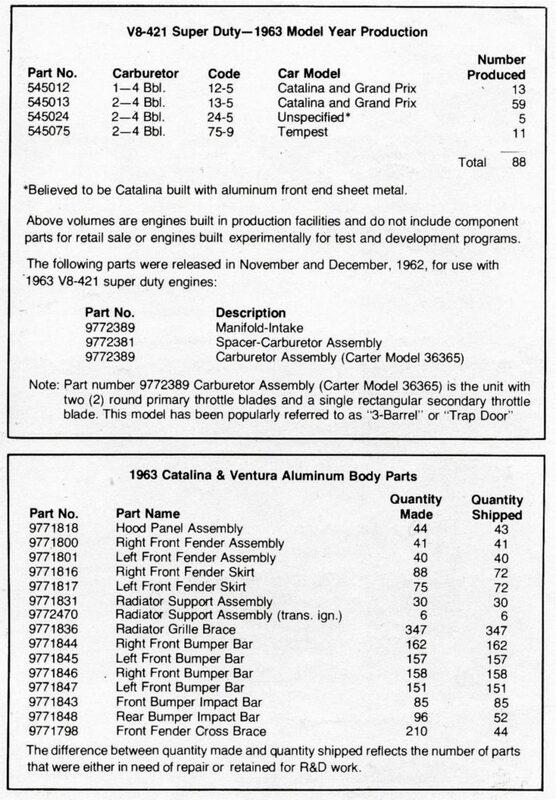 Factory listing for the Group 35 Super-Duty 421 cars shows the B-W T-85 three-speed as standard and B-W T-10 four-speed optional. Pontiac’s Malcolm “Mac” McKellar came up with a new cam and dual valve springs that allowed shift points as high as 6,400 rpm. Tuned aluminum exhaust headers, just 27 pounds per set, were mated to a single muffler system. While Pontiac upped the 421’s horsepower from 405 to 410, the new heads, camshaft, valve train and compression increase translated into a solid 40-50 horsepower bump. Racers experimented with a variety of cams, including Number 10 and 12 McKellar grinds. Early in 1963, Royal Pontiac’s B/FX Lightweight tuned by Frank Rediker and driven by Jim Wangers, posted times in the low-12s at 117-119 mph. Wangers went on to a class win at the NHRA Indy Nationals. 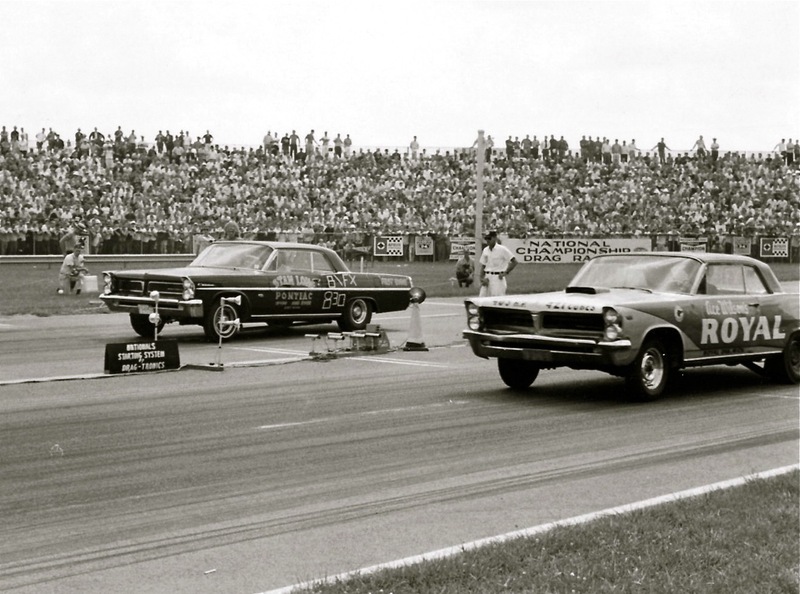 Howard Maselles later drove the Packer Pontiac lightweight into the NHRA record books, setting the C/Stock record at 114.64 mph in 12.27 seconds. 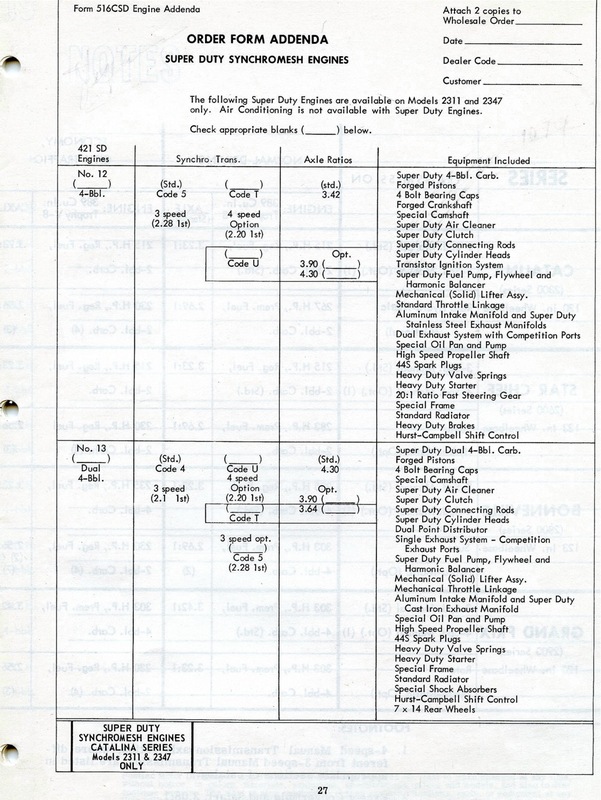 Total production of 1963 SD-421 Pontiacs is pegged at 88. This includes 14 lightweight full-size models and 12 Tempest compacts, plus steel-body cars and development vehicles. While it is hard to deny the performance of lightweight Pontiacs or the romance attached to factory lightweight cars, the decision to drill-out the chassis was questionable. Lightening the chassis resulted in a lack of structural integrity that affected safe, reliable performance. They had to be braced and, in many cases, replaced. In retrospect it was not a smart decision. Pontiac’s Super-Duty racing programs were officially shut down on January 24, 1963, a victim of GM’s racing ban. It was the end of the road for the Bunkie Knudsen programs that had successfully reversed Pontiac’s early-1950s stodgy image. But, all was not lost. 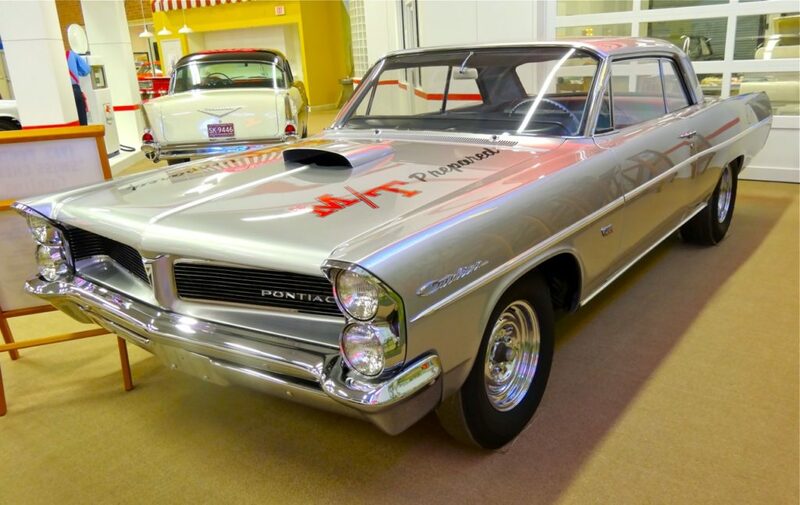 Less than one year later, Pontiac would jump-start the Supercar revolution with a car called the GTO! Outstanding story on a true Pontiac legend!! Sorry, really don’t have a clue.